I was watching a documentary about the Voyager space missions called “The Farthest” last week. For those who don’t know, the Voyager space missions took advantage of a rare planetary alignment to launch two space probes to explore the outer planets of the solar system. The missions started in the ’70’s and both probes are still transmitting back information to earth. After watching the documentary and listening to the scientists and engineers who worked on the project, my overwhelming impression was one of pathetic insignificance. 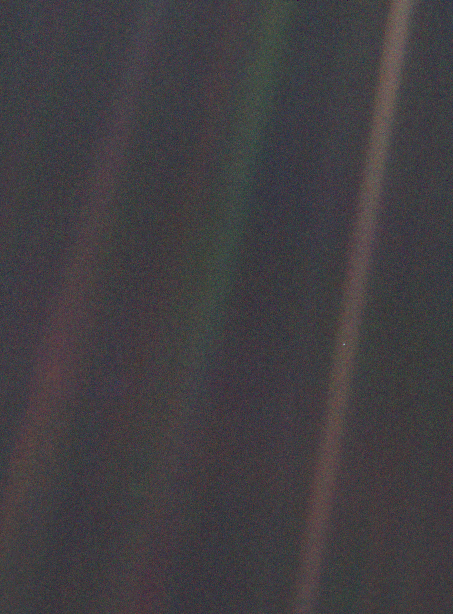 This is epitomized in a documentary by Carl Sagan who presented the speck of dust – the pale blue dot picture that was taken by Voyager 2 from somewhere beyond Neptune. Earth is seen as a barely perceptible speck in the brightest of the bands in the photo. Many of the scientists talked during the documentary of how significant it was that mankind had managed to send a vehicle into outer interstellar space for the first time. But no, this is not Star Trek, not even close. So I wake up for a morning’s quiet time with God. We are all less than nothing. Then my sin – my falling short – pops up its ugly head again. Like a fleshy root or fungal growth out of my flesh, like Alien it is too powerful for me. It looms large in my imagination, overwhelming me, threatening to completely take over my life and destroy it, me, my family and destroy Christ’s reputation in work, church, friends. Whoa, stop, back up, it really is no more significant than I am. It’s also pathetic. “Yes, that’s pathetic little me” I think. Is that really the God of the universe calling my name? And then it all comes rushing back. God is infinite powerful love. He cares about me, us, everything. One day He will put me to sleep and remove this sin that so easily entangles me maybe on my last mortal day, maybe before then. In the meantime there are good works to do which He has prepared beforehand. Works that He cares about, works that give us significance. What a wonder it is to be called a child of God!